Author: Linda Hunter, Chaibou Elhadji Oumarou. Series edited by: Wilhelm J.G. Möhlig. Hausa belongs to the Chadic languages and is the most widely spoken language in West Africa. The present book focuses on verbal art in Hausa. Important aesthetic aspects, like rhythm, metaphor, tension and morality, are explored. The six chapters deal with those aspects, using abundant examples from narrative, poetics and film. The figure of the trickster, which is introduced at the start of the book, shows what makes a text a piece of art and a storyteller an artist. The author explains that the trickster is the embodiment of verbal aesthetics. The characteristics of the protagonist are energy, a sharp mind and selfconsciousness which might even turn into arrogance. The protagonist has supernatural powers that are transferred to the artist and his story. In poetics bigness plays an important part, bigness that is not only achieved with pictures but also with the kind of presentation. For example, the poet Alhaji Mamman Shata (Katsina) uses singers and drummers to accompany his performance, so that the appearence of this ensemble alone is impressive. The individual verses are structured by repetition and parallelism, which contributes to an overall strenghtening of the work. The rhythm betrays the real master of poetics: while the novice does not change the rhythm once chosen, the expert plays on the initially established regularity and creates aesthetic tension by alternating between denial and fulfillment of the expectations of his or her audience. The intended result is a balance between total symmetry and creative asymmetry and the creation of bigness without getting monstrous. There is no doubt that Linda Hunter and Chaibou Elhadji Oumarou’s book on gwaninta or aesthetics, [...] marks a significant development in Hausa Studies and criticism. [...] To the best of my knowledge it is the most detailed study yet, drawing parallels between a number of artistic genres – oral songs, written poetry, building and architecture, embroidery and prose fiction. The authors have shown how master artists in these genres relate the aesthetic principle of bigness, layering and rhythmic patterns to craft their master pieces. The volume comprises six essays analysing different aspects of Hausa verbal art, created and disseminated in both oral and written forms. The Authors discuss them in a broader perspective, taking into account the visual, performing and some other categories of art. 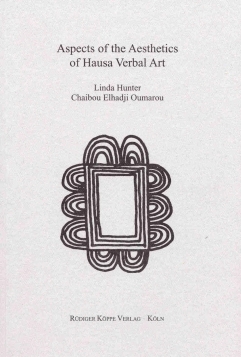 [...] the work by Linda Hunter and Chaibou Elhadji Oumarou raises many questions connected with the aesthetics of Hausa verbal art. They discusses it as a part of art in general. It is a valuable input into our knowledge of the ancient and modern Hausa literature.